The Open Data Institute (ODI) has developed a new approach for organisations to identify and manage data ethics considerations: the Data Ethics Canvas. 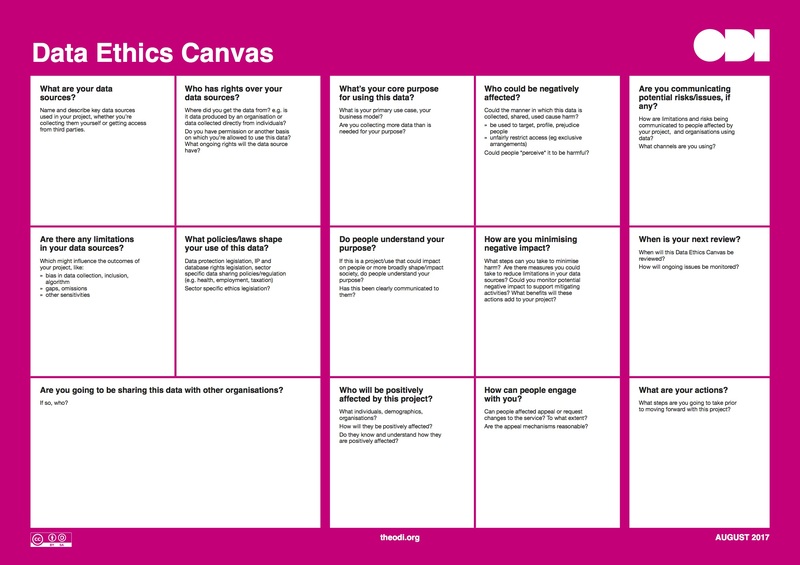 The Data Ethics Canvas is designed to help identify potential ethical issues associated with a data project or activity. It promotes understanding and debate around the foundation, intention and potential impact of any piece of work, and helps identify the steps needed to act ethically. ODI will continue to test and improve the Data Ethics Canvas in the months to come, and would welcome feedback and ideas. You can write at policy@theodi.org.